Class passes work as a block of passes that an attendee buys up front (usually at a discounted rate). They can then redeem these passes to attend specific classes within a given time period (that you specify). Class passes are available to Standard subscribers and above. To set up a class pass, navigate to Setup > Discount options. The pass will appear as an option below the tickets on all events that you've made it available on. A customer must buy at least one qualifying ticket with their initial class pass purchase - this will act as the first redemption against the class pass. Valid tickets will automatically be taken off the customer's class pass allowance each time they return to make a booking, providing it's within the redeemable time window and they use the same booking email address (which is how Bookwhen recognises them). As an account admin you can book a class pass on behalf of a customer. Just make sure you specify the customer's email under 'Booker contact email' when making the booking. Published toggle - This switch determines if the class pass is published. If unpublished, the class pass will no longer be available to purchase, but attendees with an existing class pass will still be able to redeem their remaining uses. If you need to cancel a customer's class pass you should contact the Bookwhen support team - cancelling the classes they have booked with the pass will not cancel the pass itself. Single use per event? If valid for additional attendees is set then the booker will be able to use the class pass for a friend's tickets on the same event they are attending. Usually, we recommend this being set to 'Single use only' which means that the class pass can only be used once on each event and it can't be used for a group ticket. 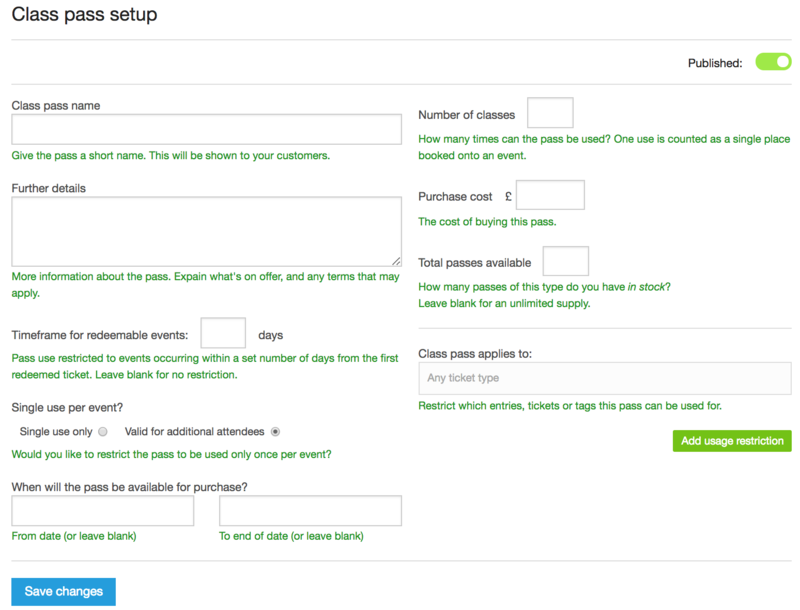 On subsequent bookings a customer can simply add tickets to their basket, then checkout. Providing they use the same booker email address they used to initially buy the class pass, then these tickets will automatically be taken from their class pass allowance. It's not possible to re-order how class passes appear after creating them. They will always appear in the order of date created. So, if the order they appear in is important to you, please bear this in mind before creating multiple class passes. You can view a customer's class pass history on their profile page. You can determine the behaviour of a Class Pass when your customer cancels a ticket they have used it for in the booking options screen (click edit in the Cancellation section). For more information on this please see our support article.